Use this list of English phrasal verbs to check your knowledge of these common-- but often not obvious-- expressions. They're important to understand if you want or need talk with native English speakers in informal-- or business-- situations. •	To back up can mean to move backwards, or to support someone. ("When my boss started complaining about my overtime, his secretary backed me up. She reminded him he had pushed me to get that work done immediately.") It can also mean to make an extra copy of data: "Be sure and back up those files. We can't afford to lose them if the computer goes down." Back-up can even be a noun or adjective: "The baseball coach asked Jeremy to be ready if he needed a back-up pitcher." •	To blow up can mean to inflate (“I blew up 50 balloons for the party.”) It can also mean to explode (“the bomb blew up in his hand”) or to ‘explode’ with anger. (“Watch out what you say to Sharon. She blew up at Norma for no reason.”) Sometimes "blow your top" is used instead: "He blew his top when his son "borrowed" the car and dented the bumper." •	To break up often means to end a relationship. •	To call on means to ask someone to participate in class (“The teacher kept calling on Sue”) It can also mean make a visit to someone’s home. •	To come back means to return. •	To come in means to enter. •	To do over means to do a job again. •	To figure out means to understand a message or solve a problem. •	To fill out (or fill in the blanks) means to write the requested information on a form. •	To follow through is to complete what one has started or promised to do. •	To get back at means to get revenge: "Tony took Joe's girlfriend, but Joe got back at him by preventing him from getting a big role in the school play." •	To get up is to get out of bed in the morning, or to stand up. For more expressions with ‘get’ (get ahead, get a hold of, get in touch, get it, get on someone’s nerves, and get side-tracked) see Common Idioms. •	To go on (or to keep on) is to continue an action. •	To go over means to review or discuss plans, work, homework, or a document. •	To hang up a phone is to end the call by setting the receiver in its cradle (or turning off a cell phone.) To hang up a picture or curtains is to fasten them in place. •	To look down on someone is to despise him -- to consider him (or her) as inferior to you. •	To look for someone or something is to try to find him/her/it. •	To look up to someone means to admire them. 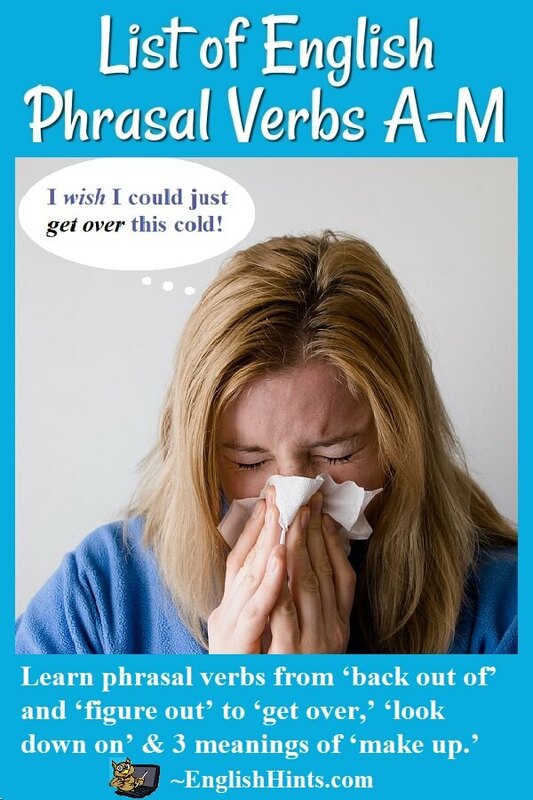 See also List of Phrasal Verbs 2, P-W.
Home > Common Idioms > List of English Phrasal Verbs, A-M. The List of Idioms can help you understand what people mean when they say they can barely “make ends meet”, tell you to meet them at 3:00 P.M. “on the dot”, say they want to get together “one of these days” (hint-- don't wait for it), or tell you not to “take your parents' support for granted."